Our collection of leather armchairs are built using solid hardwood frames and 100% genuine leather and bring a little extra sophistication to your home. A quality leather armchair makes a bold statement in any home, whether as a standalone piece or as part of a matching set. 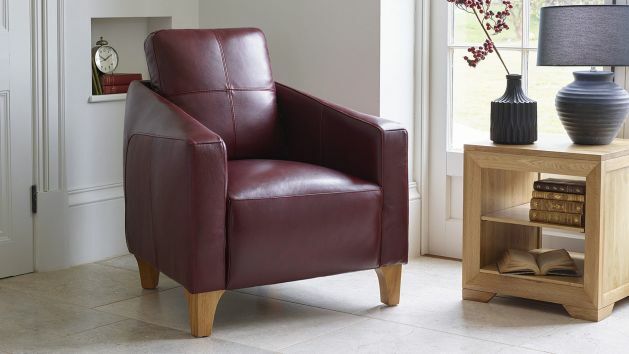 At Oak Furniture Land, each leather armchair we produce is made using the very best materials. Built using solid hardwood and 100% genuine leather, you can be sure to enjoy your investment for many years to come. Available in variety of designs in colours ranging from burgundy to light brown and cream to black, there’s a leather armchair to complement your interior design plans. It doesn’t matter whether you’re looking to upgrade your family room or complete your hallway, a leather armchair never fails to impress. If you like your armchair oversized, then the stylish Monza leather armchair could be the one. With its firm, padded cushions and smooth 100% leather finish, it’s the perfect retreat when it’s time to take a moment. For a more vintage look, the classic Oliver leather armchair makes an elegant addition to any home. With its solid oak legs and traditional scroll arms, it’s a timeless design that can outlive passing trends with ease. Or, if you’re looking to achieve the contemporary, city centre penthouse look, then the Devon electric recliner cuts a modern silhouette and is the ultimate in lazy lounging. Every leather armchair in the Oak Furniture Land collection is built to withstand the test of time, but with a little extra TLC, you can keep your investment looking as good as new for longer. Use a leather care cleaner with a microfibre cloth to gently wipe away any dirt and stains, and then follow with some leather conditioner or protection cream. This will ensure the leather remains well nourished soft to the touch. For extra peace of mind, our Furniture Guard Cover protects you against accidental damage for five years and can be purchased for as little as £29.99.